With Edraw Organizational Chart, you can create clear and comprehensive company organizational charts with no prior experience. As you can see by studying the company organizational chart below, these types of charts are the ideal way to illustrate the inner structure and hierarchy of a company. Visualize the organizational structure of your company in order to make strategic decisions for succession planning, corporate reorganization, and communicating company statistics to key management personnel. An example company organizational chart, depicting with boxes, horizontal lines and vertical lines. The boxes represent employees. Additionally, horizontal lines between boxes stand for company employees who hold similar titles like managers. Employees who fall vertically beneath a certain employee have lower ranks. Company organizational charts have four basic types: functional organizational chart, matrix organizational chart, divisional organizational chart and hierarchical organizational chart. Using this kind of software, management can present the structure of a company. Some chart software allow for chart presentation in PowerPoint, by company intranet, and other solutions. 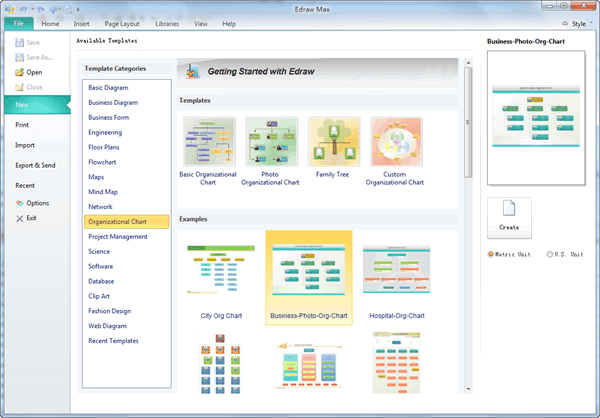 Edraw Organizational chart lets you chart even with prepared templates. By using the charting software, a company can advance their organizational development goals, cutting costs, and meet employee efficiency goals as well as satisfy any corporate downsizing needs for the organization to meet corporate mandated levels of employee employment. Delineate clear lines of management in order to manage the human capital without overlap of duties or function between different layers of management and human resources. This is where organizational charting, the chart for mapping the company, comes into work. Company organizational chart is an excellent way to get a new idea explained in the staff organization structure. Edraw has some great new tools for creating a visually appealing organizational chart. Here we will take a look at creating a simple company organizational chart. To efficiently create the company org chart, it is best to get the basic template first before worrying about the graphic effects. You can always change the effects later. Open edraw software, Click the New item in the File menu. Choose the Organizational Chart item in the Template Categories. Drag the org chart shapes from the template and position them. After getting accustomed to selecting shapes and adjusting their positions, it's probably a good idea to start adding text. To add text to the chart, simply double click on a shape and begin typing away. Once you have the basic outline of the company organizational chart complete, it's time to add some theme effect to everything. This is done using the Format tab on the Ribbon. 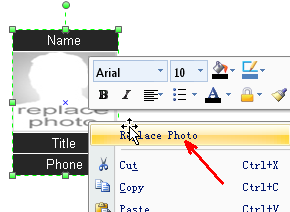 Another feature is inserting photos at the organizational chart symbols. This allows you to insert company staff's photo. You do not need to be graphic design expert to insert professional-looking content. A good way to help the graphics in your chart stand out better is to change the background. Just drag the background style from the background shape templates.